Hyperglycemia occurs when people with diabetes have too much sugar in their bloodstream. Hyperglycemia should not be confused with hypoglycemia, which is when blood sugar levels go too low. You should aim to avoid spending long periods of time with high blood glucose levels. The underlying cause of hyperglycemia will usually be from loss of insulin producing cells in the pancreas or if the body develops resistance to insulin. The main 3 symptoms of high blood sugar levels are increased urination, increased thirst and increased hunger. Hyperglycemia is the name given for high blood glucose levels. Diabetes UK lists a value of over 8 mmol/L, taken at least 2 hours after the last meal, as being higher than normal. 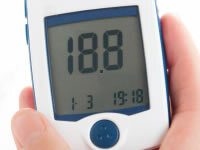 The Mayo Clinic notes that the signs of high blood sugar may not appear until blood sugar level's rise above 11 mmol/L. Signs that your blood sugar is high can include feeling thirsty, needing to urinate often, feeling tired and lethargic, feeling hungry despite having eaten recently and not being able to think as clearly as usual. If blood glucose levels rise without being adequately treated, the following symptoms may develop: fruity smelling breath - if ketone levels rise as well, nausea or even. coma. There are a range of factors that can bring on high blood sugar levels. Non-strenuous activity, such as walking, can help to decrease blood sugar levels. People taking insulin may need to increase their insulin dosage. Adjustments to insulin should only be done with your health team’s approval. If you are unsure, contact them first. If you frequently get high blood sugar levels, arrange to discuss with your doctor how to manage your blood glucose. Download a FREE hyperglycemia factsheet for your phone, desktop or as a printout. Short term complications of very high blood sugar levels include ketoacidsosis and hyperosmolar hyperglycemic nonketotic syndrome. Ketoacidosis is a dangerous complication that mainly affects people with type 1 diabetes but can also affect some people with type 2 diabetes that are dependent on insulin. The risk of ketoacidosis becomes significant if blood glucose levels rise above 15 mmol/l (270 mg/dl). There is a higher risk of ketoacidosis if a dose of insulin is missed or during periods of illness. A dangerous complication known as hyperosmolar hyperglycemic nonketotic syndrome can affect people with diabetes if blood glucose levels remain very high, above 33 mmol/l (600 mg/dl) for an extended period of time. Regularly having high blood glucose levels for long periods of time increases the risk of organ damage occurring which can lead to health problems that are commonly referred to as the long term complications of diabetes. Try to keep as close to the HbA1c target of 48 mmol/mol (6.5%) as this will reduce the chances of developing diabetes complications. When aiming to achieve or get close to this target, ensure you do not put yourself at a high risk of regular or severe hypos. How to avoid and deal with hyperglycemia? Minimising long time exposure to high blood sugar levels is one of the key objectives of diabetes control. Testing blood sugar levels will help in managing hyperglycemia. People who take insulin may be able to take additional insulin. However, only take additional insulin if your doctor is happy for you to do so, as miscalculations could lead to dangerously low blood sugar levels. Diabetes UK advise people with type 1 diabetes to test for ketones if blood glucose levels rise above 15 mmol/l or the signs of ketoacidosis appear. Contact your health team if high levels of ketones are present. If blood glucose levels remain high for long periods of time, contact your health team for advice.